Dreams have always been mysterious.. Some say they are just fairy tales without apparent logic; some say it tells about our past; some say it tells about our future; some say it tells about are present; and then some don’t say at all.. I have seen dreams vary from person to person. And then they make their own concept about what they see.. But some things are common..
Dreams have always intrigued me.. The way the brain works.. All the mysteries.. It’s all so alluring.. My interest in psyche and psychology has been from childhood.. Isn’t it fascinating?! As a child I used to wonder why I dreamt what I dreamt.. Some dreams were recurrent.. Most didn’t make any sense!! As I grew up I did some reading, not much of a research you could say; just light reading.. And I was fascinated all the more! The other day I started reading “The Interpretation of Dreams” by Sigmund Freud. But I just started.. 😛 I was soon reminded that I had my whole life for reading such books, as for now I needed to concentrate on my academics! Yeah, right! You hear that so often, right!?? Lol 😀 .. Anyhow! In a documentary I came to know that sometimes you dream about your work. Your mind perfects yourself when you sleep and dream. It’s said, anyhow, that REM (rapid eye movement) sleep is needed for consolidation of memory, mostly the memory of skill. You don’t believe all these humbug till you actually see it, do you? But then some dreams are not related to work.. You cannot place the dream.. And if anyone asks you what you saw, you have no answer! Because it’s not what you saw that mattered! It was what you felt!! That feeling.. That old familiar feeling.. That sways you. And it’s stuck with you even when you are awake! Maybe your conscious and logical mind tells you, “C’mon! it was just a dream, not real”, you can’t reason with yourself at times, can you? You are stuck with that “feeling”! Could be good, could be bad. As they say, dreams open the door to your subconscious mind. All those feelings of guilt, hatred, love, sadness, longing, etc. just comes out like that and gets you right there. Just another day, I was standing by my terrace room door. There’s a construction going on the opposite side of the road. There’s this man. He’s sitting with a 1m by 2m sieve and a garden spade.. The sieve is inclined against the outer wall of the building. 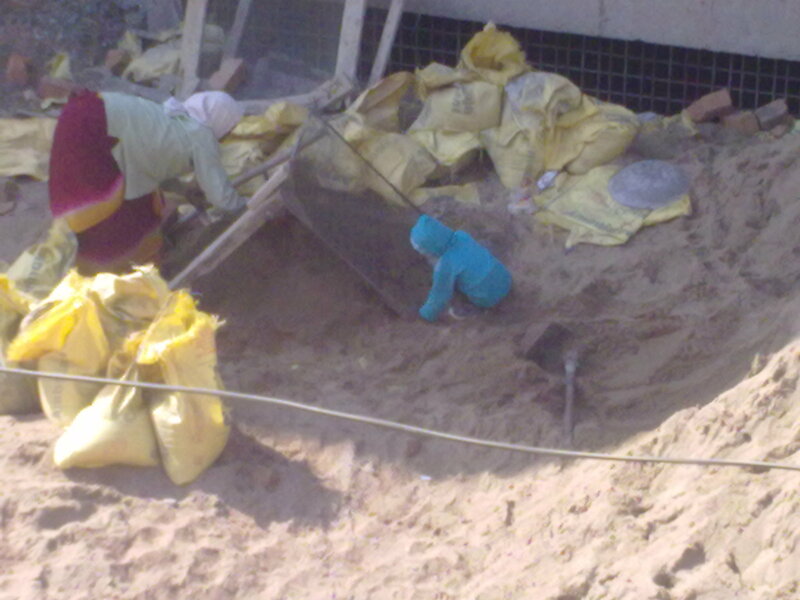 There’s a heap of sand just half a meter away from where the man was working. Using a bigger spade he throws some sand on the sieve. He sits down on one side of the sieve and uses the garden spade to sift the sand. The coarse particle remains on his side of the sieve and the finer particles of sand form a small heap on the other side of the sieve. On the other side of the sieve, mimicking his dad, is a 3-4 year old boy, around 2 feet tall, looking all cute and adorable. On his countenance is the expression of a man who’s doing the most important thing the world could offer. I watch them work diligently sieving sand. After sometime, the man got up, strolled away from their work area, took out a packet of guthka (chewing tobacco) and swallowed it down. His son, meanwhile still sieving sand, looked back at his role model just at that precise moment, but got back to sieving quicker than he had turned to look at his dad.. The man picked up the spade picked up some sand on the spade and asked his son, who was having the time of his life STANDING on the sieve and sieving the sand, to move from the sieve, as he was about to throw the next packet for sieving. The kid shows his hand to his father, asking him to stop, removes the coarse particles of the sand with his garden spade from the sieve, and then motions with his hand to his dad as if giving a green signal..!! The man waits patiently for his son to move. He’s too tired even to scold him it looks from where I stand. Or, perhaps, he was different from other dads. His son moves, and he gets back to his work. Within few minutes, the man stands up and strolls inside the building being constructed. His obedient 3yr old diligently sieving the sand. The kid stands up and looks around to see his dad missing.. He gets apprehensive for a while. That’s the first time I see a “child” on the countenance of this 3yr old. He looks as if he’s about to cry. But that countenance disappears quicker than it appeared. He goes to the heap of sand, throws his spade (like his dad had done just a while ago) on the sand. He looks around and sees a spent guthka packet lying on the ground. He picks it up. I cross my fingers. “Don’t!”, I want to shout. My voice stifled by the cold northwesterlies that hit me. He looks inside the packet, turn it over in his other palm and gulps the contents. He throws the packet with the attitude of self-importance; picks up the spade he had thrown into the sand; goes back to the sieve and starts sieving again……. How do you think this child will grow? How do you think Raja’s 2G scam gonna affect him? How do u think 20% off for burgers at McDonald’s gonna help him? How do u think home loans and education loans will help him? What will his psychology be like? How do you think he’ll perceive this world to be like? I had so many questions in my head.. I felt so lost inside.. Am I the only one feeling so? Hello.. Last blog I left at External Parent. personality that stores information about what elders teach you. emotions like, anger, happiness, depression, guilt, creativity, etc..
testing/processing the data it accepts or denies the data..
as a hard hearted person. the books, I’m OK, You’re OK, Staying OK, Games People Play. Now what’s an External Parent..? So, ultimately, we depend on he Parent to tell us what’s right and wrong..
and your parents scolded you or punished you..
guardians, elder brother sisters, uncle aunts, teachers..
“feel” that you’re not responsible for all the destruction that you’re doing..
don’t think even he’d want to be an External Parent for all of mankind….. and the most give-away proverb that supports this assumption is, “God helps them who help themselves”. So, I think it’s time we started helping ourselves, rather than waiting for God to do miracles…..